Never pay full price for an ebook again! The ebook you want, from the store you choose, at the price you like. Publishers often use a price drop to drive their ebook up the sales charts, and then revert to the higher price. Don't pay the standard price, buy it when Luzme tells you its cheap! You just have to add it to your Watchlist. Add the book to your watchlist and we check the prices for you! When the price changes, then we email you so you know. You can also set a limit, so you only get alerts about price changes, when it's dropped below your limit. and start to add books to your watchlist. I have a Kindle and I only buy from Amazon. What's in it for me? 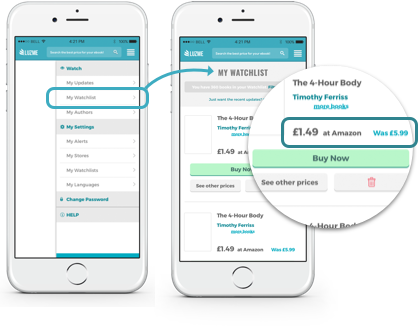 Luzme sends you an email alert when a book on your watchlist drops in price. Or, when an author you follow releases new Kindle ebooks. Sounds great but I'm not in the USA. Does that matter? Not a problem! Luzme works in all the major English-speaking countries. How much does Luzme cost? 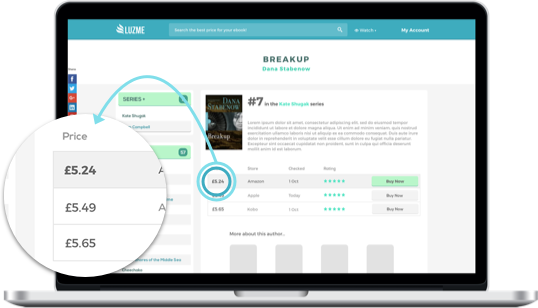 If I use Luzme to buy books online, do I have to use Luzme to read them? No! Just use your usual ebook reader as you do now.